It is never too soon to think about preparing your heating system for the winter. After running the A/C all summer long fall HVAC Maintenance is a necessity. Getting your system ready for freezing temperatures will ensure that your building will be comfortable all winter long. Also, as part of your bi-annual maintenance, an inspection could catch any hidden issues in your system. Therefore, avoiding an inconvenient malfunction, which always seems to happen at the worst time. Conduct an inspection of the unit for appropriate refrigerant level and adjust if needed. Inspect base pan for blockages in drain openings and remove obstructions as necessary. Examine the coil and cabinet and clean as needed. Check the fan motor and fan blades for wear and damage. Older models may require extra lubricants. Inspect control box which may include contactors, relays, circuit boards, capacitors, sump heat and other accessories. Replace any damaged or worn parts. Check the compressor and associated tubing for damage. Complete inspection and cleanse the blower assembly. Older models require lubrication of motor plus an inspection of the fan belt, and replacement if necessary. Check the combustion blower housing and remove any lint, dust or and debris. Examine the evaporator coil, drain pan and condensate drain lines and clean. Investigate the burner assembly, clean and make necessary adjustments. Inspect the ignition system and safety controls. Check the heat exchanger or heating elements. Inspect the flue system for proper attachment to the furnace, any dislocated sections, and signs of corrosion. Examine the control box, associated controls, wiring, and connections. Inspect all ductwork for leaks and signs of corrosion. We recommend facility managers check and change out filters as needed and if they have the expertise to do so. Changing out the filters improve your system efficiency and reduce wear and tear. There are many benefits of bi-annual maintenance. One being energy cost savings. Our technicians carefully calibrate your system to make sure it’s running efficiently. 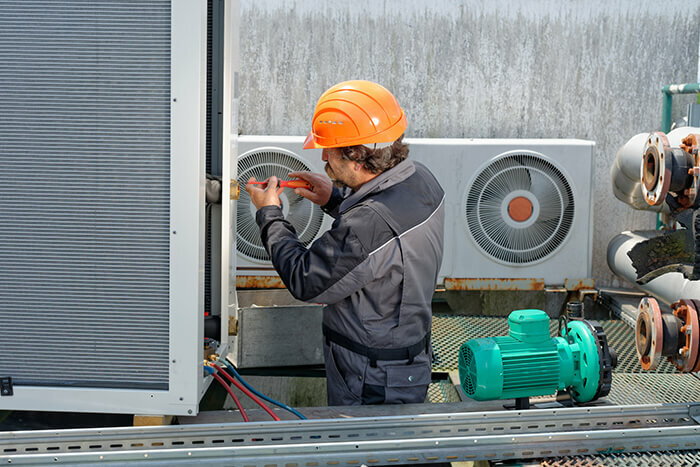 And, most importantly, scheduled, bi-annual maintenance extends the life of your HVAC unit, in addition to reducing the odds of costly emergency repairs. Contact The Severn Group today to schedule your Fall HVAC Maintenance. Our qualifies technicians will perform a complete inspection and service your unit accordingly. We want to make sure you are protected all winter. Ask us how a scheduled Maintenance Contract will begin helping save your business save on energy costs.